Many families are discovering the value of allowing their kids to play educational apps on their smartphones or tablets. We don't have any such device, but sometimes the kids play on their Nana's iPad or their Lola's Android tablet. When the call went out to the Mosaic Reviews team members for volunteers to review iTooch apps, I raised my virtual hand and borrowed a tablet to give it a try. 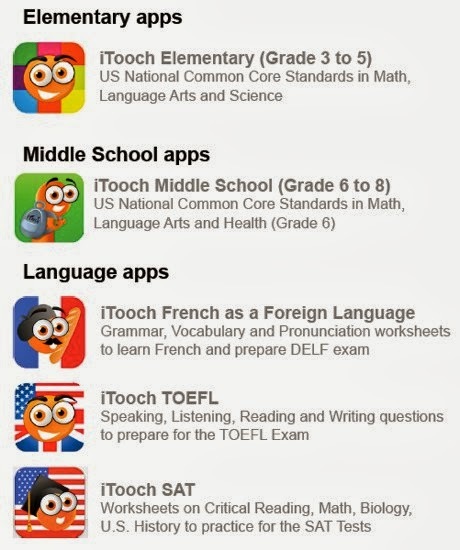 iTooch apps are put out by EduPad, a France-based company whose mission is to put out the best educational apps "based on the US National Common Core Standards" for elementary and middle school students. Their apps are available on iOS, Windows 8, and now on Android devices too! We downloaded the free 3rd Gr Language Arts, Music, and TOEFL apps from the Google Play Store. I would really have liked to try the 3rd Gr Math, but it would not download/install, so I gave up. As far as I understand it, the free apps have limited content, while the full versions (most priced at about $5) cover a lot more material. As Miss M and I worked through some of the questions, we were at times frustrated by not knowing what we were supposed to do to answer the question. There were no instructions about what to type or where to click. Though we were able to figure out most of it, a little beginning tutorial would be nice. Miss M enjoys most games and had a pleasant time with the 3rd Gr Language Arts and Music apps, but she didn't seem particularly engaged, nor do I think she learned anything she hadn't already known well. I spent the most time in the TOEFL Prep app. TOEFL (typically pronounced TOE-full) is the Test of English as a Foreign Language. Many universities require TOEFL scores be submitted by applicants for whom English is not their native tongue or who did not attend a secondary school conducted in English. Since I have taken TESOL (Teaching English to Speakers of Other Languages) classes in the past, this is something that interested me. I was excited to see a Listening section where you could hear samples of native speakers of English saying things you'd encounter in every day conversations. I was bothered, however, by some of the questions. For example, they misidentified some of the stressed words. In all the apps we used, I did not feel there was much instruction happening. I'd have liked to see an interactive "teaching" section followed by the questions and test sections. The apps mainly seemed to be a series of random questions that would be useful for review, but do not do much in the way of teaching. In other words, if you're looking for a way for your kids to review material they already know, iTooch is great! Miss M and I both loved the cute little iTooch character cheering you on with every new page. His various costumes and antics were amusing and added a great deal of lovableness to the apps! If you're looking for an educational app to keep your kiddos busy and help them review, try searching for iTooch in your app store and find out if it is a good fit for your family! Nice review. This is very useful. Thanks for sharing.